In Massachusetts, tens of thousands of low-income residents are unable to afford legal representation when facing life-changing legal problems such as domestic violence, immigration issues, drug and alcohol addiction, housing issues, foreclosures, or denial of veteran’s benefits, to name a few. Unlike the right to legal representation provided to defendants in criminal matters, there is no such guarantee of legal aid for individuals and families dealing with civil matters. These families are left to navigate these complex legal matters on their own, putting themselves and their families at risk. For these families, justice is simply unaffordable and inaccessible. Fortunately, a variety of civil legal aid programs throughout the state have been established to provide legal services to low-income residents facing civil legal issues. Approximately 880,000 state residents, 12 percent of the population, have incomes at or below 125 percent of the federal poverty level ($30,750 a year for a family of four), making them eligible for civil legal aid. Unfortunately, 2 out of every 3 residents in need of civil legal aid must be turned away due to lack of funding and resources for the civil legal aid programs. Eric Robbie, Seta Eskanian, and John Gardella of the CMBG3 team joined Massachusetts Supreme Judicial Court Chief Justice Ralph D. Gants, the Massachusetts Bar Association, the Boston Bar Association, and hundreds of other lawyers, business leaders and law school students at the 19th Annual Walk to the Hill for Civil Legal Aid to advocate for increased funding for civil legal aid programs in Massachusetts. 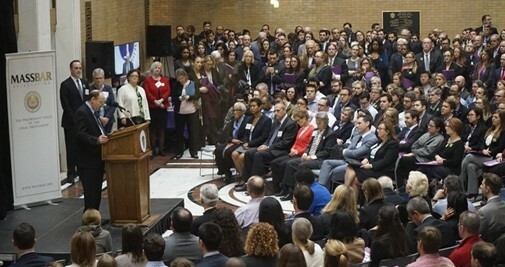 The event, held at the Massachusetts State House, was sponsored by the Equal Justice Coalition, an advocacy group for legal aid recipients and attorneys. One of CMBG3 Law’s founding principles is dedication and commitment to serving our community. We are proud to support the Equal Justice Coalition in advocating to increased access to justice for our neediest residents. If you would like to discuss our involvement with the community and our support for charitable causes, or ways that you can help low-income residents in need of legal services, please do not hesitate to contact Eric Robbie, Seta Eskanian, or John Gardella at 617-936-4353.